When it first debuted in the 2011 model year the all-new Chevy Volt established an entirely new segment in the global automotive marketplace. 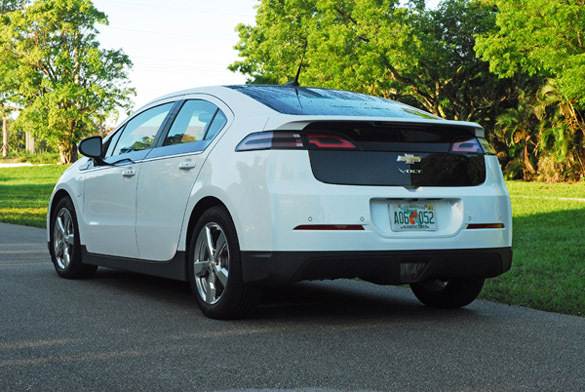 The Volt is a five-door, four-passenger midsize sedan designed to provide the benefits of an electric vehicle without the range limitations associated with other electric vehicles. 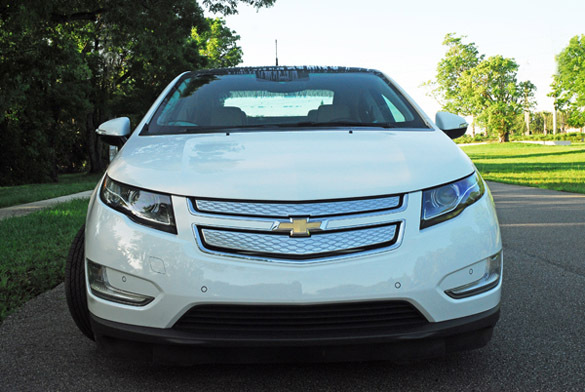 After recalls and production stops to fix battery and braking problems, all has been ironed out and the 2012 Chevy Volt is ready to take-off from Chevy dealers across the U.S. and around the world. After test driving the Volt for seven days I came away impressed with its power, quietness, ultra-modern and comfortable interior and driving fun and enjoyment. Charging it up every night I also hardly put any expensive gasoline into the small 9-gallon tank. New for 2012 is Chevy’s MyLink Infotainment system which includes Bluetooth-enabled streaming audio for music and select smartphones, voice recognition for the phone, music and audio systems. Pandora and Stitcher smartphone compatibility, Gracenote (Playlist+ and Album Art) and software that can be updated for the Gracenote database. 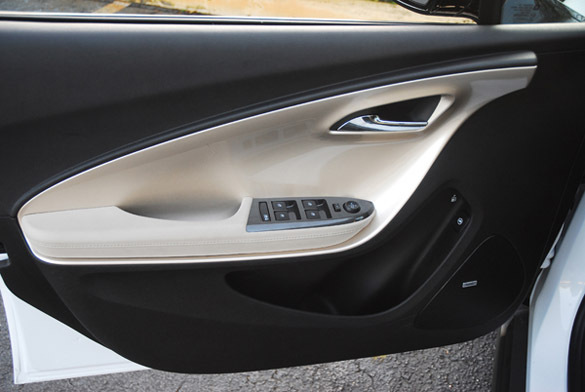 A new convenience feature is passive entry for all doors and liftgate (with the keyfob in your pocket or purse you just have to grab the big pull-out door handles to open any of the doors when locked), larger 17X7 inch aluminum wheels (mine were the optional polished aluminum), turn-by-turn navigation included with OnStar, and Summit White that my test Volt was painted. Blue Topaz metallic is another new paint color. The Volt is truly unique because it offers a total driving range of up to 379 miles, based on EPA estimates. For the first 35-45 miles it can drive gas-free and tailpipe emissions-free using a full charge of electricity stored in its 16-kWh lithium-ion battery. When the Volt’s battery runs low, a 1.4 liter, cast iron block/aluminum head, DOHC gas-powered engine/generator seamlessly engages to extend the driving range another 344 miles on a full tank. This distinguishes the Volt from electric-only vehicles, which cannot be operated when recharging is not immediately available-such as during a power interruption or on a long-distance trip. When you take your foot off of the throttle and when braking, electricity is generated and sent from the front wheels to the battery. In slow stop and go city traffic you’ll hardly use any of the electric power from the battery. The heart of the Chevrolet Volt is its Voltec propulsion system, which combines electric drive and an efficient, range-extending engine. 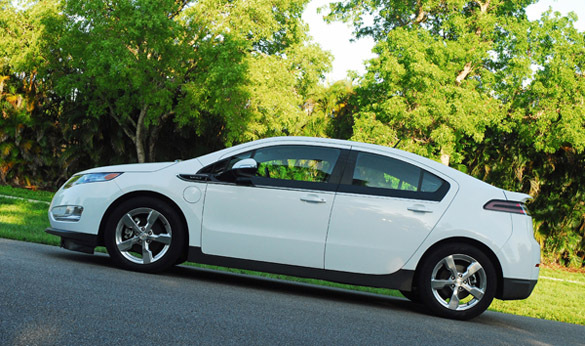 The Volt’s long-life battery consists of a 5.5 foot 435 pound T-shaped 16-kWh lithium-ion battery pack. It supplies energy to an advanced 111-kW (149hp) electric drive unit to propel the vehicle. 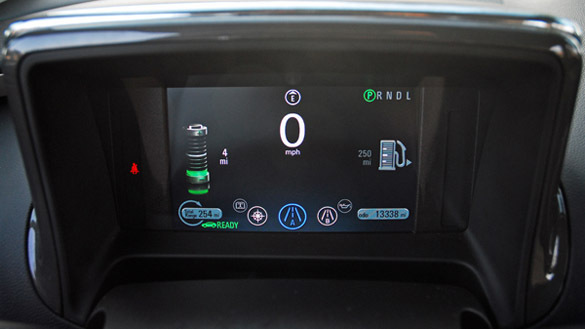 Using only the energy stored in the battery, the Volt delivers an EPA estimated 35-45 miles of fuel-and tailpipe emissions-free electric driving, depending on terrain, driving techniques and temperature. The Volt’s battery is simple and intuitive, and can be done with a 120V conventional household electrical outlet, or a dedicated 240V charging station. 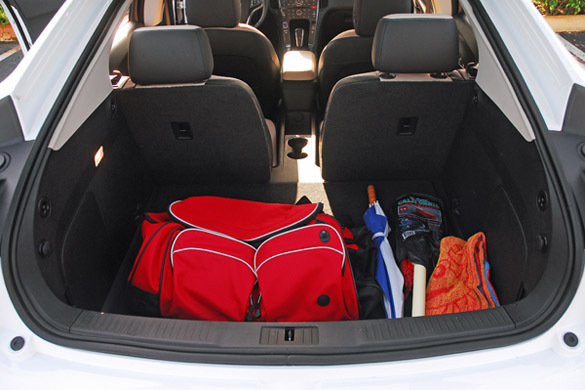 The vehicle is completely recharged in about four hours using a 240V outlet and 10-12 hours in a 120V outlet. Once the vehicle is plugged in, owners can schedule either immediate or delayed charges, even coordinating charging according to departure time or when electricity rates are lower. 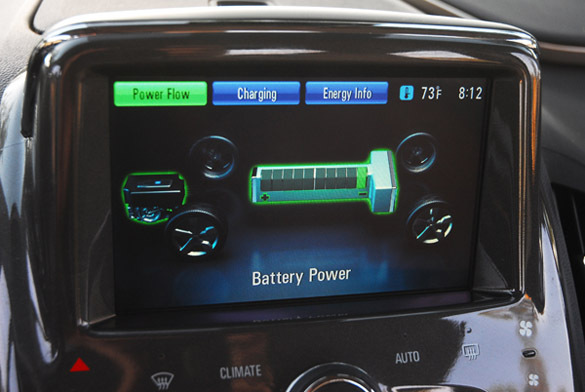 Owners also can manage and monitor the Volt remotely via computer on MyVolt.com or an exclusive smartphone application. Chevrolet Mobile App powered by OnStar. Working closely with aerodynamicists in GM’s wind tunnel to shape the Volt, design and engineering teams developed the most aerodynamic vehicle in Chevrolet’s history-0.28. By reducing the energy needed to overcome air resistance, Volt aerodynamicists contributed an estimated eight miles of electric and 50 miles of extended range. 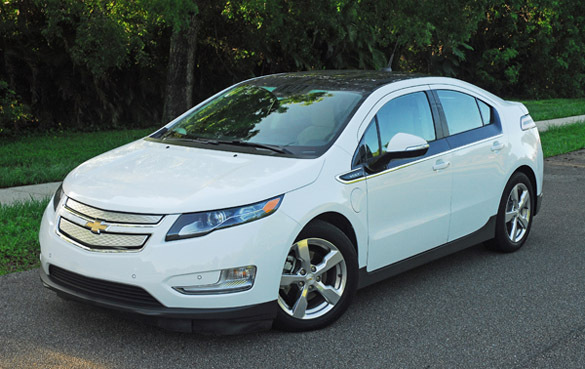 The Volt’s rounded, filled and flush grille and front fascia, tapered corners, low height, aero-styled/heated/folding/power-remote sideview mirrors, and lower grille enable air to move easily around the car to reduce drag. In the rear, sharp edges and a carefully designed spoiler on top of the rear ligtgate control air flow. An aggressive rake on the windshield and back glass also help reduce turbulence and drag. Below is a full-perimeter, color contrasted bodykit that lowers the car’s center of gravity enabling it to hug the road and also increase it high speed stability. A front airdam helps channel air into the lower grille to cool the engine, while a rear diffuser underneath help manage airflow out the rear. Top speed is 100mph. 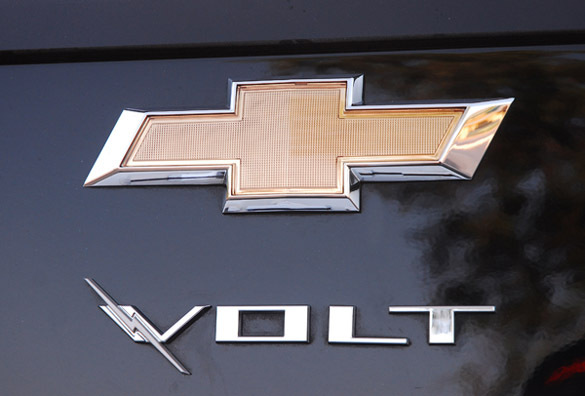 Volt’s construction is a single-body-frame, (unibody) with front/rear crumple zones, galvanized steel front fenders, hood, roof, door panels while using one-piece bodyside outer panels and thermo plastic olefin (TPO) front and rear bumper fascias. 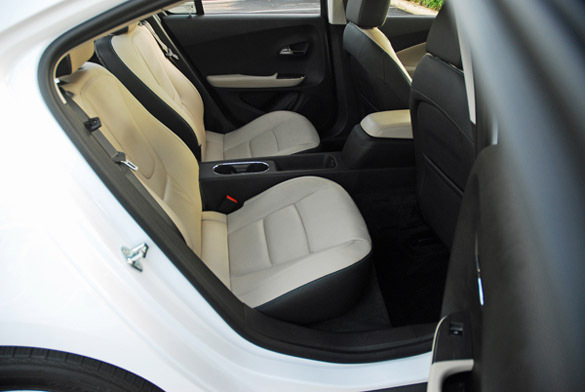 Inside the Volt offers the space, comfort, convenience and safety features that customers expect in a premium five-door sedan-including storage compartments and 40/40 rear folding seats that enlarge the already large trunk. 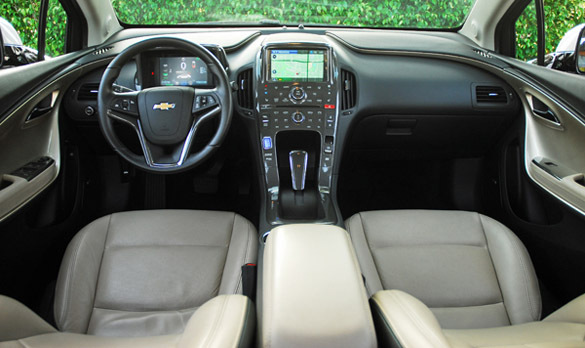 It also delivers them a variety of interior color, lighting and trim options unlike any offered before in a Chevrolet sedan, but with Chevrolet’s signature dual cockpit design. The car is very advanced with two seven-inch, high-resolution full-color screens are featured with ‘touch activation’, no buttons or dials, except for one to change the navigation system and one for the radio volume/on/off. On is a reconfigurable graphic cluster display with all of your important driving cues, and the other, in the center stack featuring that ‘touch screen’ display for the climate control, radio control and navigation system. Down below is the integrated shifter that is large and easy to use. 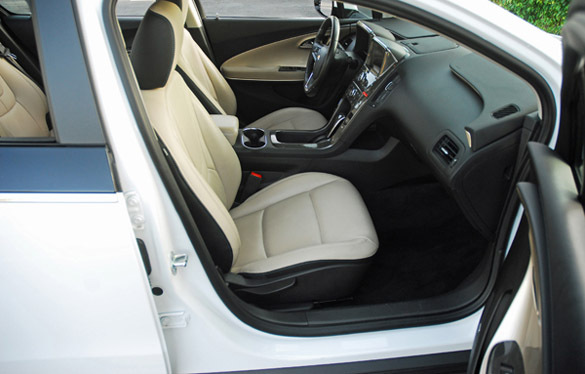 The seats are very comfortable and supportive with leather trim optional. Standard interior features include an audio system with CD player/MP3 playback and a seven-inch color touch screen display, USB audio interface port, SiriusXM satellite radio with three-month trial, Bluetooth phone connectivity, automatic climate control, keyless push button start/stop ignition, auto-dimming reaview mirror, MyVOLT.com vehicle connectivity, three auxiliary 12-volt power outlets, front dual cupholders, storage bin, rear dual cupholders and storage, remote vehicle starting system, dual map lights, map pockets behind each front seatback, variable speed intermittent wipers/washers, dual lighted vanity mirrors, thick cut-pile carpeting and front/rear floor mats, tilt/telescoping, sporty, 3-spoke steering wheel with cruise-control buttons and audio system buttons, power windows all with express down with driver’s side express up, power door locks. A charge cord and 120V portable charger is standard. Options in my test volt included a premium Bose audio system with navigation, DVD Rom and 30GB audio hard drive storage, leather/heated front seats, leather-wrapped steering wheel, rear camera and ultrasonic front/rear parking assist sensors. 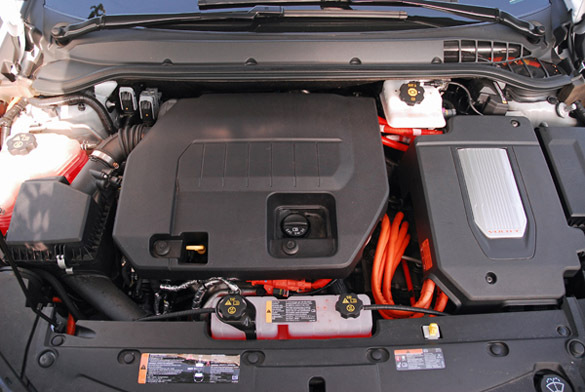 The Volt’s MacPherson strut-type independent front suspension setup, a sophisticated compound crank rear axle, specially tuned coil springs, and a quick-reacting rack-mounted electric power steering system with a ZF steering gear have been tuned to deliver a smooth, refined ride with very responsive handling and a solid, on-center feel. A low center of gravity combines with the wider track and long wheelbase for balanced performance, and front and rear hydraulic ride bushings help eliminate road harshness and vibrations. Braking is also superb with power-assisted, regenerative front brakes with vented 11.8 inch vented rotors with 60mm single-piston binders, and 11.5 inch vented rotors with 38mm single-piston binders in the rear. Standard ABS helps keep you in control during severe braking maneuvers and when braking on slick or wet pavement. Volt rides on lightweight aluminum wheels that weigh only 17.8 pounds each compared to 24.2 pounds for typical 17X7 inch wheels. They are wrapped with Goodyear 215/55R17 inch Fuel Max low-rolling resistance all-season radials that are optimized for electric vehicle range, noise, feel and performance. Standard safety features include airbags-dual-stage frontal/side-impact/knee for driver and front seat passenger, airbags-roof rail side-impact for front and rear seats, traction control, StabiliTrak, LATCH system for child seats, theft deterrent system, daytime running lights, pedestrian friendly alert, 3-point safety belts for all four seats with front pretensioners/load limiters, headlamps auto on/off, and a tire pressure monitoring system. With a starting price of just $39,145.00 what else is there to say. The Chevy Volt has the size, comfort, high-tech, unique propulsion system, futuristic interior, ride comfort and handling, like no other electric/gas vehicle on the market, especially for the price, which also doesn’t take into account federal, state and local government rebate programs. If you only drive 35-45 miles per day, and more than 50% of U.S. drivers do, you’ll never have to put gasoline into your Volt.